A contest has been brought forth by a mysterious benefactor promising the secret of life itself to the studious soul who can unlock the secrets of Dr. Victor Frankenstein's research. Now scientists race across 1819 Paris to gather the materials needed to continue the dark work that was abandoned by the deceased doctor twenty years prior. Strategic worker placement allows you to gain materials, knowledge and the money needed to reach your goal. Upgrade your stats to earn victory points and build advanced body parts. Manage resources properly or they will spoil and earn less victory points. Hire scoundrels from the docks to do your dirty work. Choose whether or not to help Captain Walton fulfill his oath to Dr. Frankenstein. 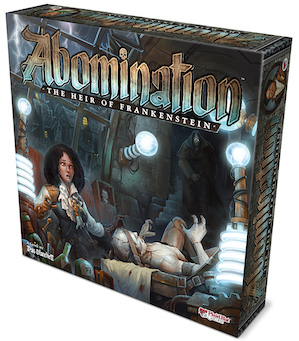 Click here to download the Abomination: The Heir of Frankenstein rules.